The National Park Service (NPS) recently proposed revisions to regulations governing oil and gas drilling in national parks, the so-called 9B regulations. National parks are a great treasure shared by the American people. When Congress created the national park system, NPS was required to balance the benefits of commercial park usage with the importance of preserving open, pristine lands for future generations. NPS created the 9B Regulations in 1978 to address oil and gas drilling in national parks. Today, there are twelve national parks in eight states with active oil and gas drilling operations. According to NPS, there are about 534 active drilling operations conducted by 98 operators. And both the number of wells drilled and the number of parks where oil and gas is drilled may grow. A lot. 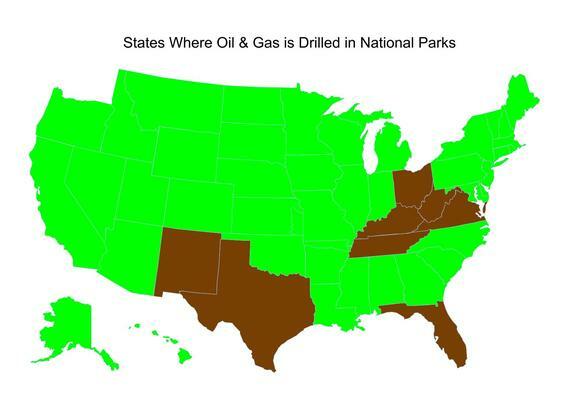 The reason for increased interest in drilling in national parks is complex. In some national parks, like the Cuyahoga Valley National Park in Ohio and Gauley River National Recreation Area in West Virginia, the mineral rights were severed from the title when the land was acquired by the United States government; in those parks, private parties own the minerals lying below the land in the national parks. The ability to extract oil and gas from shale using a combination of horizontal drilling and high volume hydraulic fracturing (HVHF) has created a keen interest in exploring all retained mineral estates including those that lie in NPS units. New interest is particularly debated in the Marcellus Shale. Many of these retained mineral rights were long thought worthless by their owners. The natural gas that can now be extracted from shale was viewed as a nuisance gas with no commercial value until about 2008. Owners with retained mineral rights are now discovering they just may have the potential for great wealth in all but forgotten residual estates. And some of those mineral estates are below our treasured national parks. A moratorium on conducting oil and gas operations in national parks is not a realistic option. The only way to eliminate all drilling in national parks would be for Congress to authorize purchase of the underlying mineral estates from private owners. Outright purchase is, however, unlikely both politically and economically. Which means drilling in national parks is a fact and ensuring that drilling is done in a safe manner an imperative. The regulations set up by NPS in 1978 did not contemplate the type or scope of oil and gas drilling now being done. The 9B rules were created before the practice of HVHF and horizontal drilling were combined. Drilling was not being done close to homes or in agricultural lands. When promulgated, few considered the possibility of drilling for miles into a park from land outside the park. Even fewer considered the economic viability of extracting oil and gas from shale in national parks located close to large population centers that depend on the parks for both recreation and to maintain the health of air and water quality. After 38 years, the regulations need reform. The proposed NPS revisions are extremely important in balancing the rights of property owners with land preservation; and they correct known deficiencies. Specifically, the proposed 9B regulations will: (1) raise the bond and financial assurance requirements so that oil and gas drillers rather than the taxpayers will bear the cost of closing sites; (2) create access and user fees that reflect fair use of national park land by oil and gas drillers; (3) empower the NPS to correct minor violations without having to choose between either taking no action or shutting down only slightly errant operations; and (4) establish a reasonable protocol that brings exempt operations within the 9B rules. Most drilling operations taking place in national parks today are exempt from NPS regulation– either because the operations were grandfathered or the wells require no federal access. In fact, of the 534 oil and gas drilling operations currently in national parks, 319 are exempt from NPS oversight. The grandfather provisions originally set out in the 9B rules were never intended to last in perpetuity. The purpose of the grandfather clause was to prevent undue surprise on oil and gas operators not previously covered by the then new 9B regulations. Since the 9B rules have been in place for close to four decades, the rationale for the grandfather clause no longer applies. Similarly, when the NPS created the access exemption nobody expected oil and gas operators would be engaged in directional drilling from outside a park beneath parkland, as are 78 operating wells in 4 national parks in 4 states. 35 wells were built using horizontal directional drilling from outside the preserve in Big Thicket alone. Well pads located outside a park clearly have less direct impact than those with well pads built in the park; at a minimum, building well pads outside the park or preserve requires less land clearing within the NPS unit. Yet locating outside a park does not prevent all dangers. Regulations are needed to be sure spill prevention measures are in place and finances are available to ensure safe and complete closure when operations cease. Simply said, creating modern rules to deal with new circumstances in oil and gas development is good for national park users, good for park maintenance, good for ecosystem preservation and good for public health. The comment period for the proposed revision to the NPS 9B rules ends on December 28, 2015.